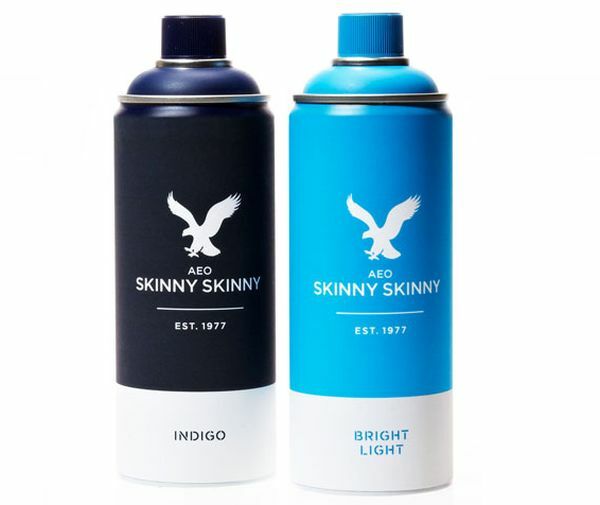 Viral Marketing Done Right: American Eagle Announces Paint-On Skinny Skinny Jeans | OhGizmo! Yes, they’re trolling. But it’s a darn good one. The 30 second advertisement featured below is about a purported new range of skinny jeans from clothing retailer American Eagle. “It’s our skinniest fit yet and is so comfortable you’ll feel like you’re wearing nothing at all,” boats the narrator. And that’s when you realize that the pants are quite literally painted on. The campaign doesn’t end with a simple video however, as they provide you with a link to a special page on their website where you can contemplate buying a can of the spray-on fabric. There is even an option to add the $50 “Limited Edition” set to your shopping cart; pressing the button brings up an “out of stock” warning. Right. Let’s be clear, this is absolutely a tongue-in-cheek hoax, as confirmed by the company’s vice-president last friday on the Today Show. But it does show the company hitting one out of the park in the field of viral marketing. The video has racked up over a million views in three days and got the Interwebs chatting. ← There’s Food In Your Hair: Would You Like Fries With Your ‘Do?